this might seem a little delayed, as Knit Nation is now well past! it was utterly brilliant - but so exhausting that even now, i'm not fully recovered (which is why it's taken me so long to post this!). the RSA & i were lucky enough to be able to have a little bit of a holiday before the madness of KN weekend - there was a family wedding down in aldermaston the weekend before, so we thought since we would be "down south" already, we might as well just stay in this awesome flat in london for the week & enjoy ourselves (which seemed to mainly consist of walking everywhere, and eating loads - there are just too many great restaurants in london!!). we even went over to paris on the eurostar for the day (where we also walked huge distances, and ate vast amounts of lovely food - i'm sensing a theme developing here!). after a week of eating, it was time to get to work - i'd shipped down all my KN stock to the lovely folk at Loop before i left scotland, & met up with them on the friday morning to unload & set up. i'd learned my lesson from last year, and had a double booth this time instead of a single - we also pushed the tables to the sides of the booth to make sure folk had lots of room to come in & browse through all the yarns (& to make sure we had room to get in & out, unlike last year!!). alas, these were pretty much the only photos of the booth that i managed to get all weekend - the moment the doors opened & all the locusts lovely knitters swarmed in, all i could manage to do was sell skein after skein of yarn (i know, what a hardship, right?). & i think it's safe to say that the new OMA bases are going to be extremely popular - halfway through the weekend, this is all that was left out of 10 kilos! i think i managed to leave the booth for about 20 minutes total all weekend - mainly for bathroom breaks, but i did snag a few minutes to run around the marketplace myself as well (and sensibly limited my purchases to one skein of wollmeise laceweight and three small cones of habu - i was far too busy selling to be able to buy very much, which makes my wallet much happier!). when the weekend ended, i only had to pack up about 180 of the 800+ skeins of yarn i shipped down (YAY!) - ysolda even had room in her van to bring them back up to scotland for me. 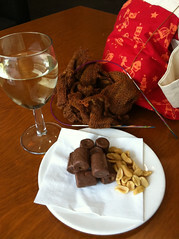 and, thanks to some excellent forward planning by the RSA, i finally got a moment to sit with my feet up & have a little knitting time (in the airport lounge - for someone who spent the weekend at a knitting event, i barely knitted a stitch!). a HUGE thank you everyone who came & bought yarn from me in london - it was SO lovely to meet so many customers (former & future!) and i wish that i'd had time to chat more with all of you. here's to another amazing event in 2013 - i think i'd better start stocking up now!!! I'm so glad you had a good time - I wish I could have been there. But my lovely daughter managed to buy me two skeins of your 4ply merino/silk for a shawl - I left the choice of colour to her and the midnight is just perfect and the selkie bag too! Just finished my second cardigan in the alpaca/silk - did an EZ cardi with the tangled yoke pattern added in Lon Dubh (the last one was Coraline in Gothic). 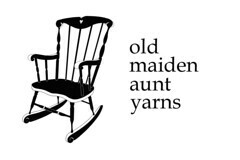 Everyone loves it - I kinda wish I had a stack of your busines cards to hand them when they are fondling the yarn! Thank you for wonderful yarn, beautifully dyed. 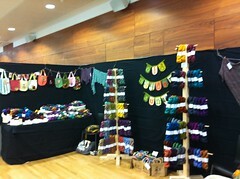 Hope the success at Knit Nation has now convinced you that the bigger studio was a good idea! Hi! 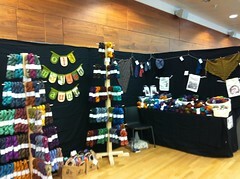 Great to hear Knit Nation was such a success and that your new bigger studio is so justified! 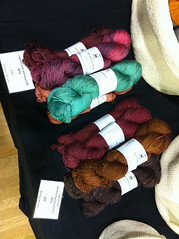 It was lovely to meet you and your RSA, as well as being able to see the colours of the yarns and fondle them in person. 2013's quite far away but I'm certainly looking forward to it!